The Champ is the name of Rockin' BZ Burgers green chile cheeseburger, and you can say it really is world famous -- it's on the 2016 USA Today Top 10 Best New Mexico Green Chile Cheeseburgers! 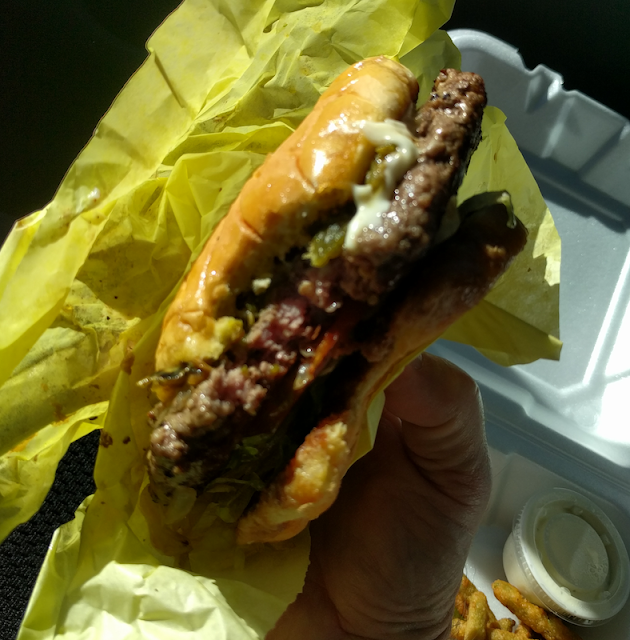 So check out my full review of the green chile cheeseburger at Rockin' BZ Burgers in Alamogordo, New Mexico with lots more pictures after the jump. This burger deserves its spot on the Top 10 list. Juicy, nicely-seasoned, and cooked to order. It's big, too -- half a pound along with cheese, green chiles, lettuce, tomatoes, and onions. (Don't worry if that sounds too big -- you can get the Half Champ, too.) Or customize the burger any way you want. It's delicious. There's plenty of sides to choose from, and one is included with The Champ. 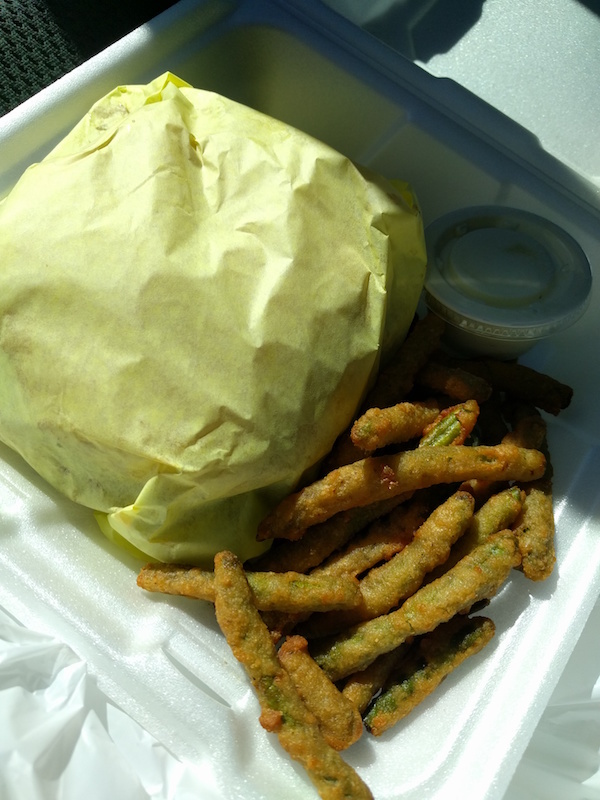 I had the fried green beans which come with ranch dressing. These were crispy and tasty -- not greasy. Loved them! I was surprised how many local guests were here. Sometimes a roadside place is full of tourists like me who are on a road trip, but the staff here seemed to know most everyone in the place. And they were really friendly to me, too -- much appreciated! What more do you want when you're hungry on a road trip? Friendly people and a great burger. 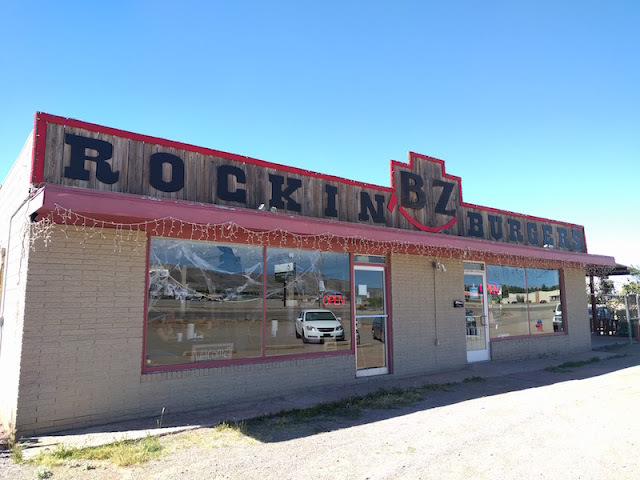 Be sure to stop at Rockin' BZ Burgers when you're in southern New Mexico. Check out and like Rockin' BZ Burgers on Facebook.